Anti-parasitic Shampoo. Hygiene and cleanliness for the skins of dogs and cats. 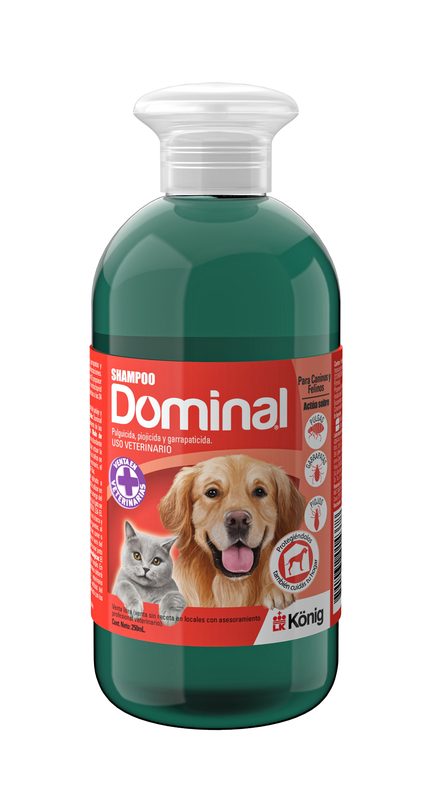 External anti-parasitic for dogs and cats. Kills fleas, tick and lice on contact. Every 100 ml contains: Propoxur, 0,165 grams; Imidacloprid, 0,150 grams; auxiliary agents q.s. Indicated for prevention and treatment of fleas, tick and lice infestations. Excellent cleaning power, ensuring hygiene and cleanliness to skin and hair. Wet the animal’s hair with lukewarm water and subsequently apply shampoo. Form abundant lather and then rinse. Repeat the procedure and allow the lather to act for some minutes before the last rinse. It is advisable to repeat bathing every seven days but the frequency may vary according to the veterinarian’s suggestion. Do not apply on kittens or puppies under 2 months old.